What is Allmetalworking.com Product News Center? Reach Global Metalworking Industrial Decision-Makers All Over the Internet World! allmetalworking.com is a comprehensive web directory for metalworking machinery, manufacturers, products and services. You can browse up-to-date supplier information on everything related to metalworking, which includes Metal Cutting Machine Tools, Metal Forming Machine Tools, Motion Control, Manufacturing System, Storage and Workshop Equipment, Tooling, Hardware, Mechanical Parts and Accessories, Testing and Measurement, Die, Moulds, Machining Services, and Metalworking Materials. Allmetalworking.com is a marketplace which connects your website to the most qualified buyers online─Being your sales for 24 hours a day and 7 days a week. 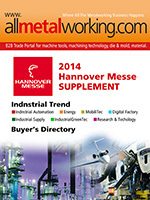 Allmetalworking.com News Center is a platform, on which global metalworking industry manufacturers can share their product information, industrial news, featured articles and white papers with industrial colleagues. Allmetalworking.com e-newsletter is delivered Bi-weekly and leads in both quantity and quality. Each product news is reviewed by our editors before released to ensure it is truly news, concise, factual, easily to read. New product news stories have always been essential information, especially to metalworking industry. Research and experience show that decision-makers in metalworking look for information on new product developments specific to their industry. Staying abreast of technological changes or competitive intelligence to protect their own market share. To acquire new sale items to boost revenue. Allmetalworking Products News Room delivers New Product Alert to the industrial colleagues directly to the desktop. Our users choose the news categories of interest and the format that meets their needs. Metalworking Product Alert covers 12 vertical market categories which creates the perfect opportunity to deliveryour products and services message to targeted audience. The key to effective advertising is to deliver your message within relevant content to accurate audience. Website visitors will read and click on your advertisements when they are surfing on interest or sourcing some specific product category. Allmetalworking.com provides you several advertisement positions to meet your specific marketing needs. Advertising location on Allmetalworking Product News Room includes Super Banner and Square Banner on Product News Room home page, Full Banner and Square Banner on category page and Full banner on category-featured company product news and full-story display ads. Subscribers receive Metalworking e-newsletter that they interest, while your ad with products news will be delivered to subscriber’s computer. There is no ad can be delivered to right industrial executive as directly as we do. Position your company as a leader in your field through innovative internet marketing options, including Top Banner, Rectangle Banner and tile banner on Product e-newsletter.